Timing, once again, has been incredibly prescient for FACT. In the week leading up to this show, the news agenda has been led by stories about Cambridge Analytica’s sinister use of our online data. It’s a real-world story which taps into societal nervousness about our relationships with technology. We’re all dependent on it for so many purposes, but the CA stories confirm our underlying ambivalence about just how much of ourselves we’re giving away. States of Play: Roleplay Reality does not signpost “TECHNOLOGY IS BAD”: it keeps itself pretty neutral. When I first came into the gallery and sit down to Pinar Yoldas’ The Kitty AI, I did wonder whether this was all going to be a bit Black Mirror but it’s William Gibson’s Neuromancer (the inspiration behind The Matrix)which is more widely referenced. Technology as an inextricable part of the human experience for both good and bad. FACT have given plenty of space is given to thinking about the allure of the virtual world. 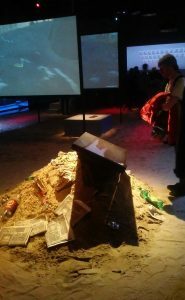 Filling the floor of Gallery One with sand isn’t a gimmick, but rather a perfect point that the experience of being involved in something different is fun – and for millions of people, this experience is found in video games. Another point about States of Play: Roleplay Reality as a whole is a point raised by my boyfriend and fellow attendee Chris. Unlike me, Chris is into video games. He came out talking about Bioshock and Papers Please, and saying that while he enjoyed the exhibition, he hoped there wasn’t going to be a movement of “the artists are here now” when video games have been making socio-political points through thoughtful storytelling for years. What an exhibition does that a game couldn’t possibly, though, is to keep you consciously aware of the line that separates the physical and digital worlds – one that is at times a very fine line indeed. 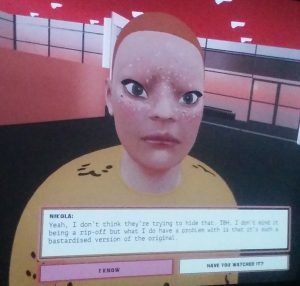 The way the men in Angela Washko’s The Game, The Game (featured image) talk to you is purely in response to your inputs, yet painfully identifiable. How many times are we typified in “roles” in the physical world? And is it always a more positive place? Not necessarily in Porpentine Charity Heartscapes’ Howling Dogs – in fact, the absorbing text-based game is almost more welcoming than the disorientation of the environment it’s contained in. Coming out of it was the same kind of disturbing disorientation I have occasionally felt looking up from my phone on a boring journey and realise how much time I’ve lost, unaware of its passing. But even though both the good and bad of the technological impact on our world is explored, I did feel a general sense of unease through the show. I think it’s because a pretty common theme throughout is of de-sensitization: what games let us get used to. This could be racial bias (as in Rindon Johnson’s Away With You), or the implications of the fact that in a world where nothing is real, nothing can hurt you. The live audience laugh as the characters of Reija Meriläinen’s Survivor are killed off. In Jon Rafman’s Open Heart Warrior, the calm of the nature scenes burns into the memory far more than the disturbances that ripple out from under the surface. The culmination is the absolutely brutality of Jordan Wolfson’s Real Violence. It’s horrible to watch, but also powerfully points out the nature of the human reaction. In both the clip and real world, who are you and how do you react? There are reasons soldiers are increasingly trained in virtual combat first. The topic of how we interact with the virtual world and what it means can be so broad, and FACT are right not to presuppose any conclusions. It actually helps to bring the tensions between the seduction, utility and potential for darkness in the virtual world to the fore. States of Play: Roleplay Reality is probably the best exhibition I’ve seen at FACT, asking us to confront some very practical questions about how what we consider reality is changing – and what this means for the human experience. This entry was posted in Current exhibitions, Exhibitions, Home and tagged art, FACT, Liverpool, technology. Bookmark the permalink.